Vous l’aurez compris, cette production est dans la lignée des précédents travaux de Yann Novak. Une ambient douce, feutrée et minimale, invitant à la contemplation. Sublime! Ян Новак в прошлом году выдал просто-таки великолепнейшие работы, и этот полноформатный альбом вообще можно назвать суммой всего его творчества. Казалось бы, полный минимализм и ничего замысловатого здесь и в помине нет — медленные петли звука, приглушенные полевые записи, неопределенное похрустывание и шорохи… Все это где-то уже было, на том же лейбле Dragon’s Eye полно таких записей. Но дело ведь не в том, чтобы выиграть какую-то гонку оригинальности или показать миру что-то невиданное. Дроун-музыка вообще не об этом, оставим джазменам и выпускникам консерваторий музыку-спорт, музыку достижений в духе “выше-быстрее-сильнее”. Сложно сказать, что главное в дроун-музыке: хочется упомянуть “искренность”, но это, на самом деле, важно вообще в любом жанре, да не только в музыке. Думаю, в дроуне очень важно дать слушателю максимальный простор, настроить его на восприятие бесконечности. То, на что претендуют различные сборники “музыки для медитации”, дроун-музыка обычно делает с пол-оборота, а дальше начинаются еще более интересные вещи: можно с легкостью провалиться во вневременное / внепространственное существование, почувствовать себя абстрактной точкой на белом листе бескрайнего листа бумаги — точкой, с которой началась вся Вселенная. Можно ясно и спокойно ощутить (или скорее даже пережить) состояние бытия “всего во всем” и “ничего во всем”, почувствовать их парадоксальное единство… И это далеко не все, этот опыт поддается изучению, имеет оттенки и стадии. При должном качестве музыкального материала и соответственной ему настройке сознания все это достижимо так же легко, как дыхание или сердцебиение. Вот почему новизна медотов или изобретательность звукоизвлечения всегда были для меня на втором, третьем, десятом месте. В первую очередь хороший дроун распознается своей сопричастностью к чувству бесконечности. Этот альбом — что-то весьма близкое к ней. Достаточно обширный, чтобы исследовать его снова и снова. “I have often wondered whether especially those days when we are forced to remain idle are not precisely the days spend in the most profound activity. Whether our actions themselves, even if they do not take place until later, are nothing more than the last reverberations of a vast movement that occurs within us during idle days”. Un ruido en expansión traspasa la atmósfera leve, anotaciones inconclusas atraviesan el espacio dejando rastros de luz incandescente y transparente, un ambiente inmersivo de texturas diáfanas. El sonido de la vida exterior se confunde con pequeños trazos sintéticos insertos en la amplia linealidad auditiva, formas abruptas que constituyen configuraciones espaciosas de materialidad inaprensible. El territorio apartado y sus efectos climáticos arrastran consigo ventiscas y armonías indefinidas, estructuras indescifrables que convergen en tramas orgánicas y superficies electrónicas, un sistema abierto de fragmentos artificiales y prolongados desarrollos, creando un hermoso paisaje de estruendos integrales. Estos parajes dilatados habitan momentos deshabitados, lugares y tiempos vacíos que ocupan algunas horas del día. Construyendo extensos desarrollos de sonidos cristalinos, el norteamericano Yann Novak crea obras donde la música se traslada con un ritmo pausado, imágenes estáticas de minimalismo sintético. Un complejo ruido inmóvil dónde confluyen fotografías, tonos difusos, naturaleza quieta, grabaciones ambientales y notas infinitas. Una visión del arte que se extiende, en cierta medida, a la plataforma que dirige. Sus trabajos han sido publicados por varios sellos alrededor del mundo (INFREQUENCY, smlEditions, Henry Art Gallery, LINE, Koyuki, Hibernate, WHITE_LINE EDITIONS, murmur, Farmacia901, taâlem), pero, principalmente, a través de su propia plataforma, Dragon’s Eye, el mismo que publica “Snowfall”(Dragon’s Eye, 2014): “No es fácil describir el estado material en que se encuentran sus partículas de audio, pues pareciera que existe una tensión permanente oculta bajo un manto de mutismo. Como en sus otros trabajos, existe una linealidad, pero una linealidad que es solo aparente, pues bajo esa movilidad estática se suceden cambios imperceptibles, difíciles de apreciar. No obstante, esta obra presenta como en ninguna otra una multitud de pequeños detalles que afloran a medida que se van removiendo las capas exteriores. Las notas que parecen no serlo se cubren de minúsculas manchas blancas, polvo que ensucia la nitidez que se arrastra progresivamente, hermosas imperfecciones que van enterrando los tonos neutrales en el suelo débil. La claridad acostumbrada es ahora un lugar difuso, y las superficies ambientales ven como su estructura se contamina de fragmentos orgánicos… El agua cristalizada que cae sobre el frío suelo y las rocas impregnadas de humedad también alcanza al sonido prístino de “Snowfall” y su panorámica invernal”. Un impecable trabajo que no es el último del músico de Los Ángeles. Después de aquel editó “Liminality” (Dragon’s Eye–Farmacia901, 2014), junto a Fabio Perletta. Al igual que este, su nueva obra, la más extensa, es solamente una edición digital, planos continuos de energía quieta. The album is comprised of two long form pieces, each exactly one hour in length, a completely immersive journey that patiently erodes any resistance on the part of the listener, slowly washing away distractions and preoccupations until the stillness takes hold. To deepen the experience, they are designed to be looped creating a truly endless listening experience which Novak rightly asserts is “divorced from the engagement more traditional music demands”. Idleness, Endlessness is understated, but monumental in scope. You will get lost in it, but then that is exactly the point. How many possible horizons? Where is the listening but in the vast ocean of its transit? 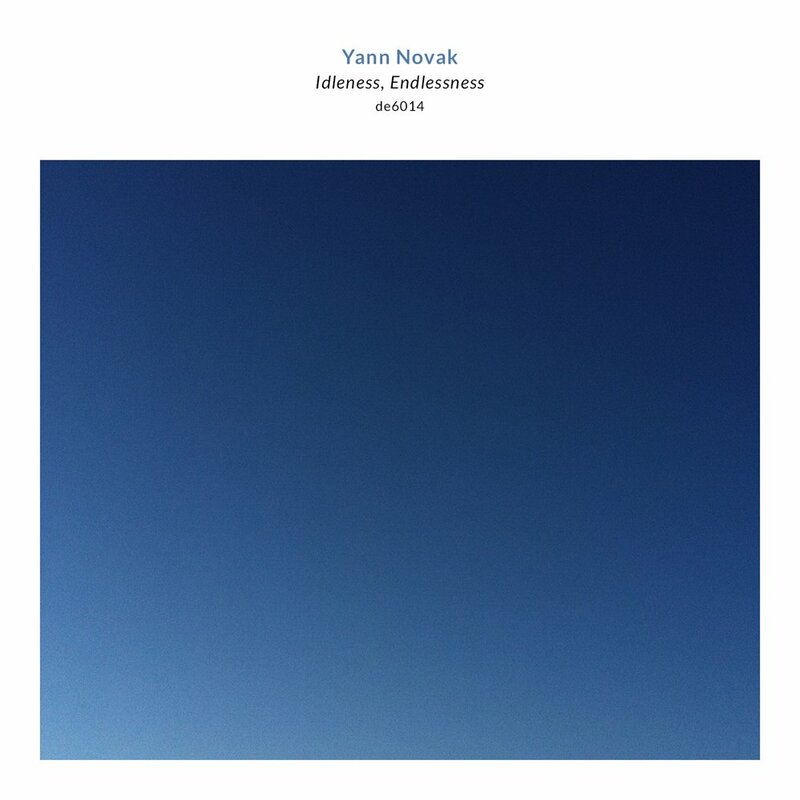 In a temporal dislocation called Idleness, Endlessness, Novak gives the soul a question, going deep inside its cosmic coordinates, submerging the listener into expansive landscapes, filled with an atmosphere that somehow merges earth and sky in a constant audible manifestation of textural drones and acute tonal silhouettes that slowly contract and extend time and rather than just laying around the second, they are present in a direct existencial motif. Two hours of sound, but endless of listening, a journey in which the the listening experience is approached in a state where the object and subject are not distinguished but melt in a serene peregrination that pays tribute to the silence inside the sound, an ineffable yet eloquent nature of time. Full emptiness. Between 2012 and 2015 the source material—synthesized tones and radio static collected on a portable synth along with a single field recording of the wind—was processed in the studio and used in live performances. The final compositions were created through improvisation with 5 minute periods of inactivity every 15 minutes to simply contemplate the piece’s preceding, and potential proceeding. “I have often wondered whether especially those days when we are forced to remain idle are not precisely the days spend in the most profound activity. Whether our actions themselves, even if they do not take place until later, are nothing more than the last reverberations of a vast movement that occurs within us during idle days. In any case, it is very important to be idle with confidence, with devotion, possibly even with joy. The days when even our hands do not stir are so exceptionally quiet that it is hardly possible to raise them without hearing a whole lot.” ― Rainer Maria Rilke, Letters on Life. Idleness, Endlessness explores labor, leisure and engagement over two hour long compositions. The source material for Idleness, Endlessness was collected while attending the Parkfield Artist Residency in September 2012. Parkfield is a unique retreat where invited artists have no obligation to create work, or anything other then their own meals each day. This creates a unique situation for contemplation and reflection. The source material consists of synthesized tones and radio static collected on a portable synthesizer, and a single field recording of the wind. From 2012 – 2015 this material was processed in the studio and used in live performances. The final compositions were created through improvisation with the insertion of 5 minute periods of inactivity every 15 minutes to simply contemplate where the piece had come and where it should go. Idleness, Endlessness is composed to so that the two pieces could be played back to back and looped creating an all day listening experience divorced from the engagement more traditional music demands.